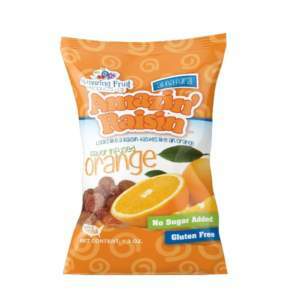 Amazin’ Raisin Orange Flavor-Infused Raisins are a delicious treat that tastes just like a real, juicy orange! Knock, Knock. Who’s there? Not your run of the mill raisin, that’s for sure! Orange you glad you found Amazin’ Raisin? As always, Amazin’ Raisins are All Natural, No Sugar Added, Vegan, Gluten Free, Peanut and Tree Nut Free, Certified Kosher, and 100% Made in the USA. Looks Like A Raisin, Tastes Like A… Orange!